Diseconomies of scale occurs when long run average costs start to rise with increased output. Economies of scale occur up to Q1. After output Q1, long run average costs start to rise. Lack of control: when there is a large number of workers it is easier to escape with not working very hard because it is more difficult for managers to notice shirking. 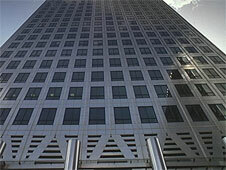 Firms may attempt to overcome diseconomies of scale by splitting up the firm into more manageable sections. For example, a large multinational may be split up into local geographical areas, with local managers facing incentives to maximise efficiency. This is the minimum point of output necessary to achieve the lowest A.C. on the LRAC. In the above diagram, the MEC is at Q1. If the MES was 10,000 cars a week and the total industry demand was 40,000. This would mean that the optimal number of firm would be 4, if there were more firms in the industry then average costs would be significantly higher. Returns to scale relates to how a firms production is affected by increasing all the inputs. If a firm faces constant input costs, then decreasing returns to scale imply rising long run average costs and diesconomies of scale. Diseconomies of scale occur when a business grows so large that the costs per unit increase. As output rises, it is not inevitable that unit costs will fall. Sometimes a business can get too big! Diseconomies of scale occur for several reasons, but all as a result of the difficulties of managing a larger workforce. As the business expands communicating between different departments and along the chain of command becomes more difficult. There are more layers in the hierarchy that can distort a message and wider spans of control for managers. This may result in workers having less clear instructions from management about what they are supposed to do when. In addition, there may be more written forms of communication (e.g. newsletters, notice boards, e-mails) and less face-to-face meetings, which can result in less feedback and therefore less effective communication. Workers can often feel more isolated and less appreciated in a larger business and so their loyalty and motivation may diminish. It is harder for managers to stay in day-to-day contact with workers and build up a good team environment and sense of belonging. This can lead to lower employee motivation with damaging consequences for output and quality. The main result of poor employee motivation is falling productivity levels and an increase in average labour costs per unit. There is also a close link between communication and motivation (which the motivational theorist Elton Mayo recognized) and so as communication becomes harder, motivation will decline. This is particularly true as managers are less able to take a personal interest in the workers. It is harder to ensure that all workers are working for the same overall goal as the business grows. It is more difficult for managers to supervise their subordinates and check that everyone is working together effectively, as the spans of control have widened. A manager may be forced to delegate more tasks, which while often motivating for his subordinates, leaves the manager less in control. External factors beyond the control of a company increases its total costs, as output in the rest of the industry increases. The increase in costs can be associated with market prices increasing for some or all of the factors of production. Factors of production are the inputs that firms use in order to produce output. The inputs include land, labor and capital. Some economists include entrepreneurship as well. For example, assume there is a manufacturer of 'widgets' in a given city. If the average wage level increases across all other markets as a result to an increased demand for labor, then to entice workers to produce "widgets", the manufacturer must pay more in wages, which will raise the total costs. 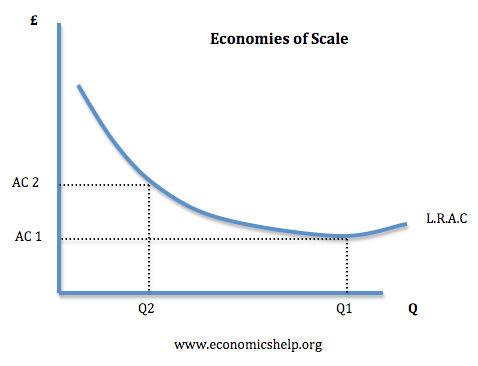 Diseconomies of scale is the point where a business no longer experiences decreasing costs per unit of output. Rather, after this point, costs per unit tend to increase. Graphically, if output is on the X-axis, and average cost per unit is on the Y-axis, the economy of scale line curves downward from left to right. But as the line continues curving to the right, it reaches a point where it flattens and then begins to curve upward. The point where it starts curving upward represents the diseconomies of scale. A number of factors contribute to diseconomies of scale. For instance, if the manufacturing process involves multiple steps, there may be a volume level that creates a bottleneck for one process. If, in the factory, process A is unlimited, but process B can only manage 50,000 units, then the company will experience diseconomies of scale above 50,000 units due to the added cost of acquiring more capacity for process B. Shipping can also create diseconomies of scale. For instance, a candle manufacturer sells candles to local merchants only. But if that candle manufacturer develops a website to increase production, then sells candles throughout the world, the added costs of shipping the candles may negate any cost savings resulting from increased output. Finally, as a company grows, it has more communication and bureaucracy issues that interfere with efficiency. If everything runs well, the concept of economies of scale works, but more output requires more people to run the company. At AsOne, not only do we invest time upfront with our clients to scope out their vision and goals, we also work with them to ensure they are looking at the right marketing objectives for the precise nuances of their campaign. It is so important that the objectives are relevant to your business and the marketing channels you are using. For instance, objectives related to PPC will be very different to those related to SEO or content marketing and the time scales will also vary greatly. Where a PPC or Google Remarketing campaign might focus on optimising the cost per click while maximising the total number of clicks, a content marketing campaign might focus on the average page rank of specified keywords, or the total number of pages ranked in Google. Specific – Objectives should be tightly related to a specific outcome or deliverable. What is it exactly that you would like to achieve as a result of your marketing efforts? Do you want to improve your average time on page, your conversion rate, or your number of email signups? And how much do you want to improve by? Measurable – If objectives aren’t easily measured it is very difficult to track how well you’re performing. Thankfully most elements of digital marketing can be easily tracked and analysed, allowing you to see exactly how far you’ve come and how close you are to achieving your objectives. Agreed upon – All stakeholders must understandand agree that the defined objectives are the right ones for the business. Do you have all the right people bought into what you are trying to achieve and are they willing to commit the necessary time and resource to make it happen? Realistic – With our depth of experience we will be able to tell you how realistic your marketing objectives are. While we aspire to big visions and goals, it is important that the objectives are realistic within the time and investment constraints. Time-based– It is no good leaving objectives open-ended. Having a clear timeframe helps to create the sense of urgency required to achieve great things. It also enables us to have regular review points to assess what is working and what isn’t. A well-defined set of marketing objectives is really only half the battle. It is also vitally important that you are properly set up with the right tools to monitor and track your results. Platforms such as Google Analytics, Search Console, or Adobe Omniture will empower you to understand the impact of your marketing decisions in a far more quantitative manner. AsOne will help to ensure that these are set up and configured properly, and will invest the time with you to help make sense of the numbers. Armed with this data, you can then evolve your campaigns over time to ensure that you stay on track to hit your objectives in the quickest time possible. One of the main reasons that we called our site and service SMART Insights is because we wanted to help marketers succeed through using a more structured approach to planning to give more realistic targets they could be more confident of achieving. Using SMART objectives and then measuring them through properly customised analytics reports is a big part of how we hope to help too. With SMART objectives documented in Plans linking objectives to strategies and KPIs everyone is sure exactly what the target is, progress towards it can be quickly and regularly reviewed, for example through an Ecommerce dashboard and, if necessary, action can be taken to put the plan back on target. How can SMART objectives help set realistic targets? Specific – Can the detail in the information sufficient to pinpoint problems or opportunities? Is the objective sufficiently detailed to measure real-world problems and opportunities? Actionable – Can the information be used to improve performance? If the objective doesn’t change behaviour in staff to help them improve performance, there is little point in it! Relevant – Can the information be applied to the specific problem faced by the marketer? Of course different people interpret define SMART differently and you can refer to the Wikipedia definition of SMART marketing objectives. Secondary marketing research uses data that already exists and has been collected by someone else for another purpose. The increasing availability and use of loyalty cards and big data has given businesses the chance to gather a wide range of valuable information on customer buying habits, allowing them to target promotional campaigns more effectively. Product orientation and production orientation are closely related concepts. However, one has more to do with the actual product in focus, while the other has more to do with the production of the product. Additionally, product orientation is typically used more in marketing strategy discussions, whereas production orientation is more of a manufacturing concept. Production orientation is a general approach to business that focuses on the manufacturing and production processes. Companies that make these processes primary focuses tend to make operational efficiencies and production optimization key objectives in improvement processes. This orientation was prominent during the industrial era and in the capitalism period of the 1950s. Says Law suggests that if a company produces good products, demand will naturally arise. With production orientation, the focus is more on the processes of production than what is actually produced. Narrow product lines, pricing based on production costs, technical product research, packaging focused on product protection, and minimal marketing are all common traits associated with a production orientation. These traits are all opposite a marketing orientation, where the company attempts to drive demand through marketing efforts. Whereas production orientation exists when management is more concerned with production efficiency, a product orientation is when management is more concerned with product quality. Managers are often obsessed with their products when a product orientation exists. Managers typically believe their products are unique and offer distinct benefits. They focus on consistent improvement of the product with the belief that an ideal product will effectively sell itself. Product orientation does have challenges and is often downplayed by marketing professionals. Management that is overly focused on technology development and endless pursuit of an optimized product may lose touch with the marketplace. Market-oriented companies research and stay connected with changing consumer tastes. This puts product-oriented companies at a special disadvantage in rapidly changing marketplaces where customer needs and product offerings are constantly evolving. Sales-oriented businesses differ significantly from market-oriented business. Bethe Hart, marketing professional and adjunct professor at both Rutgers University and Immaculata College, explains that a sales-oriented business approach has several defining characteristics that set it apart from a market-oriented business. These include the need for aggressive selling methods, a tendency to plan for the short-term rather than the long-term, the need for heavy promotion and the assumption that consumers will buy the product if the company makes it. One example of a sales-oriented business is an online Internet marketing company that attempts to sell consumers any number of different products. This could be, for instance, a business that attempts to sell software to consumers and other businesses to meet their needs. These types of businesses create products that are based on the assumption that the product will meet the need of the business or individual, whether they have expressed a need for the product or not. Business-to-business sales also provide another example of a sales-oriented business approach. Companies develop products that may benefit a business and then rely heavily upon aggressive marketing tactics to sell them. Examples of products sold in this type of market can include advertising sales or technologies such as point-of-sale software and machinery that will allow the business to run more efficiently and profitably. Chances are the business owner was not initially looking for the product, but did so because the salesperson showed him some benefit to buying it. Another traditionally sales oriented-business model that is similar to the business-to-business model is the door-to-door sales method that some companies rely upon to sell their products. These companies will create a supposedly superior product that can be demonstrated in the home and try to show the potential consumer how it will benefit her in the long run. For example, a salesman selling the "world's greatest vacuum cleaner" may attempt to sell the product to the housewife who has a toddler crawling around on the dirty carpet. Various types of home improvement products can also provide the occasion for the establishment of sales-oriented business approach. These, too, are sometimes sold on a door-to-door basis, but they are often peddled over the phone first to get the interest of the homeowner and establish an appointment to show the product. While many consumers do have a need or even a desire for such products and may seek them out in a large retail home improvement store, some will inevitably buy products because aggressive sales and marketing professionals approached or contacted them.